No person involved in so much history received so little attention as the late Robert C. Byrd, the longest-serving U.S. senator. 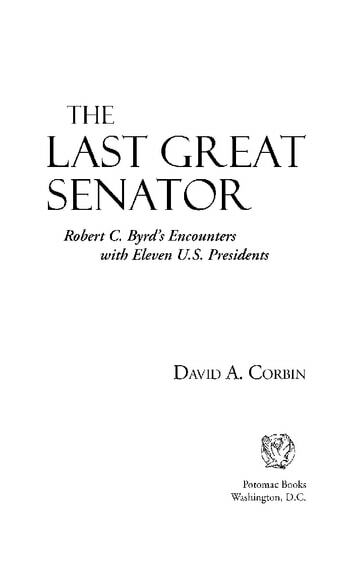 In The Last Great Senator, David A. Corbin examines ByrdÆs complex and fascinating relationships with eleven presidents of the United States, from Eisenhower to Obama. Furthermore, Byrd had an impact on nearly every significant event of the last half century, including the Cold War, the civil rights movement, the Vietnam War, KennedyÆs New Frontier, the Watergate scandal, the Reagan Revolution, the impeachment of President Clinton, and the Iraq War. Holding several Senate records, Byrd also cast more votes than any other U.S. senator. In his sweeping portrait of this eloquent and persuasive manÆs epic life and career, Corbin describes Senator ByrdÆs humble background in the coalfields of southern West Virginia (including his brief membership in the Ku Klux Klan). He covers ByrdÆs encounters and personal relationship with each president and his effect on events during their administrations. 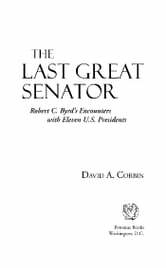 Additionally, the book discusses ByrdÆs interactions with other notable senators, including Lyndon B. Johnson, Richard Russell, Mike Mansfield, and especially Robert and Edward Kennedy. Going beyond the boundaries of West Virginia and Capitol Hill, The Last Great Senator presents Byrd in a larger historical context, where he rose to the height of power in America.